So I finally caved and bought one of these flying monstrosities…. 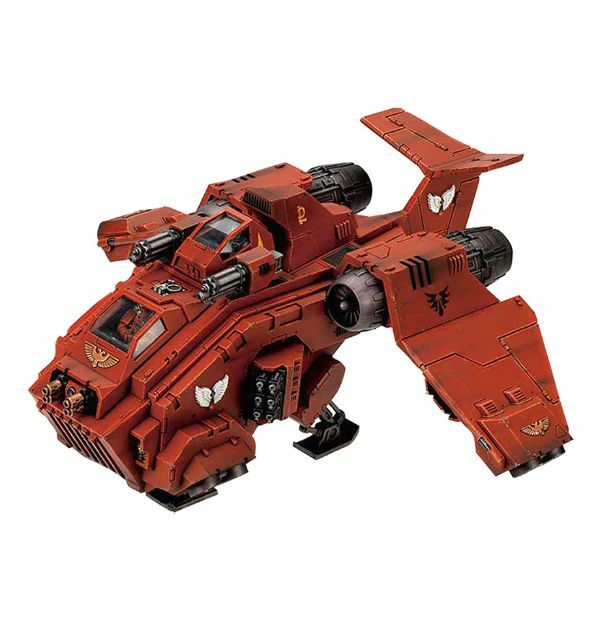 Quite often the better half and I joke about how it looks like a Thunderhawk Gunship was towed and put through a cube crusher before a Techpriest took pity on it. This really put me off until I found out about the conversion kit done by Chapterhouse Studios, whilst I don’t endorse how much Chapterhouse infringes on GW’s rights or feel the need to tell you buy their products, I am impressed by their conversion kit which lengthens out the hull of the Stormraven to make it look like it can carry what the fluff tells you it can. Anyway, I digress – I decided to follow as much of GW’s paint guide as possible. So I started with an undercoat of skull white on the exterior surfaces and skull black on the metallics and interiors. After that dried, I pulled out the handy airbrush and applies a base coat of Mechrite Red to all of the exterior surfaces and the crew. Interior surfaces, engines and landing gear all got a 50:50 mix of Chaos Black and Boltgun Silver applied. So I recently discovered how to pull this effect off when I flicked through a copy of the Games Workshop’s ‘How to Paint Citadel Tanks’. In the book they show some pics of Nid Bio-Acid damage done to some Imperial tanks and described the process. I decided to apply this to the Death Company Drop Pod I’m working on. I placed the acid damage high up on the pod petal purely for aesthetic reasons (alternatively you can picture a Gargoyle high up, getting a passing shot at the pod as it hurtles past!). I also decided to have the acid eat through to the interior a bit…. The method for it is pretty easy, I drilled some holes into the area I wanted affected by the acid, gave it a brush with a 50:50 mix of chaos black and boltgun silver then used warlock purple over the area that the acid hit. When that dried I highlighted some of the holes with tentacle pink. Finally I coated the area (well, splattered) with water effects paste. After 24 hours that was the effect.